"One of the dangers in doing a prequel is trying to make people who hadn't met before meet. And all the fans said, 'We never heard about Franklin having gone on this mission with Sheridan before. They never mentioned it in dialogue.' And I thought, well people don't normally tend to say when they met for the first time, and if it was a classified mission they wouldn't talk about it freely. So it is a bit of a stretch that he and G'Kar and Franklin would all meet at this point would meet, and never mention it again, ever. But I had to do something. It was two o'clock in the morning and I had to do something." Sorry for the necro, but just watched ITB and couldn't find any info about Delenn meeting her future husband during the Earth-Minbari war. Is this an alternate timeline? Not quite sure how you mean it, but there is a scene where Sheridan and Franklin are captured by the Minbari and brought before Delenn before execution. They don't actually meet because he never even sees her face. I myself have often wondered about the fact that she never mentioned the incident to him in the show. You know it could have gone like, "Hey you know that time during the Earth-Minbari war when you and Franklin were captured. You were going to be interrogated and executed, but then you repeated what Lenonn told you to say and your life was spared. THAT WAS ME!" I mean I understand that ITB was shot around the same time as Season 5, so it is just an oversight that she never mentions it during Season 5, but it sure would have been great to hear her explain it during Season 5 - you know like a wedding night story. How a Minbari word taught by the dying breath of the ranger leader saved his life during the war. Delenn would say how he knew him and looked up to him. In fairness I believe almost twelve years had past between their meetings. I doubt he would remember exactly what her voice sounded like. She didn't say much and what she did say was spoken in authoritative Minbari. It would have been nice to mention the meeting at some point during Season 5, but JMS can't think of everything. All kidding aside something like this would have helped cement their relationship. 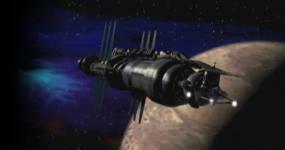 One weakness of B5 is that the story is told within the constraints of a television show format. They really can't show you everything and one thing we definitely don't get established well enough is the relationship growth between Delenn and Sheridan. I mean they do kind of go on their first date in Season Two, A Race Through Dark Places, but for the most part them falling in love as it is shown to us feels rushed to me. It isn't some awful thing that ruins the show by any means, it is just a slightly noticeable flaw. When they start to get emotional toward each other it just seems a bit like did I miss something. I look at it as another one of my "Read Between The Episodes" moments. Remember you can imagine that other things happen on the station in the time that passes between episodes, so maybe Sheridan and Delenn actually spend quite a bit of time together when we're not seeing them on screen. - In his tale the Rangers have existed continuously, despite Naroon having made clear in Season 3 when Delenn took command that the Religious Caste recomissioned them after centuries & it had always been the Warrior Caste who oversaw them in the past. - There is no way that Sheridan, Franklin & G'Kar had met before (its explicit at the beginning of Season 2... the same episode where we meet Satai Hadronn of the Religious Caste.... that Sheridan is new to Franklin). That event may have occured with G'Kar and 2 humans; or Franklin another human & a Narn; but there is no way it was the 3 of them. - Mollari had been a weak joke in the Royal Court. There was no way he could have ordered a strike like that. The strike could have happened & he could have been in on it; but I think he was assuming more responsibility than he was due out of a general guilt complex relating to his... other deeds. Most glaring of all... Emperor Mollari II states he cared for all four of his wives... this more than anything else is the most blatant signal to the fans to take everything he says with a grain of salt. The Rangers were charged in 1261 (after the end of the Shadow war) to watch for the Shadows return and intelligence gathering activities. They weren't actually commissioned to fight again. And as Lenonn pointed out there were few of them now most were getting old and they were seriously underfunded. Coplann and Hedronn are one and the same. Coplann used an alias while parading as a functionary from the Minbari Ministry of Culture while investigating Delenn's status for the Council. How do you know? It was a classified mission and as pointed out you never get to see G'Kar and Sheridan's first meeting. It's Ganya Ivanov. And does every officer aboard a ship know the names of all the crew? How do you know that Ivanova and Sheridan didn't talk about Ganya while they were posted to Io. Londo as far as I recall is not directly responsible for ordering the strike, he was certainly responsible for providing faulty intelligence. Grasping at straws aren't we, here's Londo just gone through 20 years of crap and only an hour or so away from his death, why shouldn't he have reconsidered his feelings? Last edited by b5historyman; November 27th 17 at 11:35. THANK YOU! I was reading through this thread again trying to remember what was going on with this specific point and you just cleared it up. He was Satai traveling incognito. I knew there was something as I was reading through the thread. My guess is that Delenn didn't use an alias because if the truth ever came out it would look VERY bad; where as Coplann is exactly as you stated and not permanently assigned to B5. Thank you so much for bring that up because I could not remember what was going on there, but I knew I knew the correct answer and you provided it. I agree and I don't even think it requires mentioning that it was a classified mission. I can't think of one moment in the show where it seems awkward. I think it fit brilliantly. They never specifically mention meeting each other before, but we also don't see every interaction these characters have and they never specifically mention that they've never met before. If I read between the lines I can imagine the three of them getting together and discussing the mission over dinner one night. Like thousands of interactions these characters would have had between episodes the audience was just never shown that moment. Maybe something like that happened, maybe it didn't. The point is we were never told they didn't meet before; unlike Garibaldi and Sheridan whom obviously did not know each other early in Season Two. I can't think of any time where the three of them having met before is a problem. In fact it actually helps with some of the logic of the show when you find out they had met before. I'm thinking of a little scene where Franklin is convinced fairly easily to accept Sheridan's help in saving Garibaldi with the alien life force device. At the time he wrote the scene JMS might not have known that he was eventually going to make it so Sheridan and Franklin had met prior to B5, but it still fits in well with that scene. Yeah I agree and I also agree with what others say. Just because we didn't see it on screen doesn't mean Sheridan and Ivanova have never discussed her brother before. For all we know they have discussed him many times. We were just never shown it on screen. There is nothing in the show that says Sheridan didn't know her brother. If anything it establishes a logic to why the two of them are so close. Ivanova had worked under Sheridan before and if they had the common bond of knowing her brother then it makes their closeness all the more believable. What I mean by that is they worked together, which doesn't always mean they are friends. Having a common denominator might have sparked their personal relationship. Just because it was never shown to the audience doesn't mean it didn't happen - and according to all whom have chimed in here there doesn't seem to be anything from JMS that says Sheridan didn't know Ganya. I agree with that and I will add that he definitely mentions being married four times in the show and he is the Emperor talking to children. He could be reconsidering feelings or he could just talking to children and their governess so he says he loved all of his wives. SIDE NOTE: We know his first wife was a scandal. Is it possible that she is a secret and Londo married a publically known fourth wife after becoming Emperor? Just a curious thought I had and decided to share. I assume he was referring to the four wives we know he had, but then I had another thought that popped in my head about his years as Emperor. No just the four. While it wasn't specifically spoken about it certainly didn't seem to be a secret.